Stainless Steel wire is durable and hygienic. 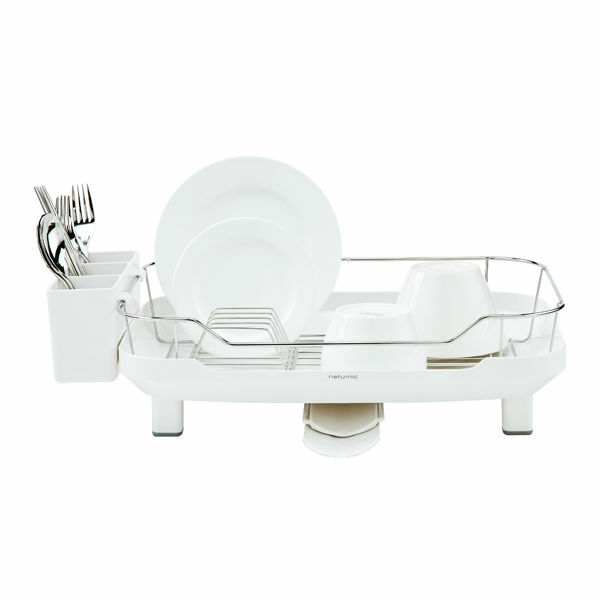 Easy to assemble and dismantle the dish rack, it is easy to clean and can use it more hygienically. Wire shelf is easy to clean due to easy separation from the dish rack. Large space for various sizes of dishes, cups, bottles, and bowls. 360-degree water spout helps the water to flow directly to the sink in any directions. The waterspout is adjustable in length, so it fits any type of sink. Can store each application separated in 3 piece spoon holder. Spoon holder can be installed on the left and right side of the dish rack. The ventilation hole drains the water outside of the holder to make the dinnerware stay dry and clean. In the bottom part of the body, it has TR mat which prevents slipping and shaking.